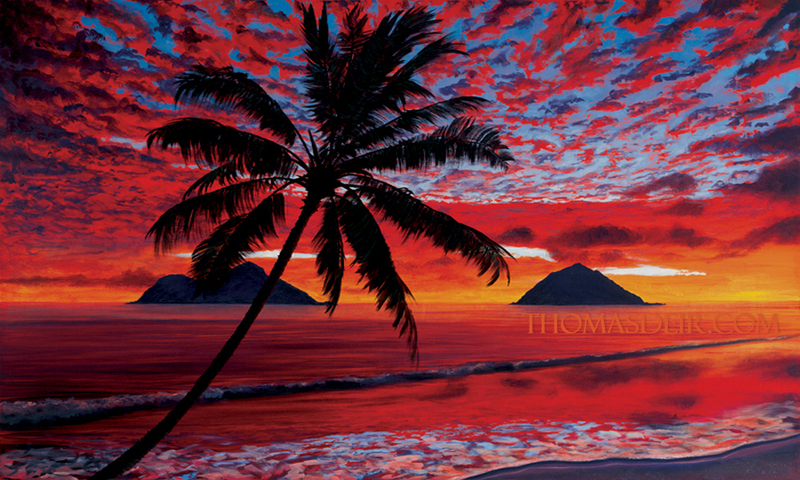 A Premier local artist, Thomas' artwork adorns homes and public venues around Hawaii and indeed the World. One of his commissioned paintings is the only painting in the USA Inventor's Hall of Fame, Akron, Ohio. Visitors to Oahu marvel at his tiled mural at the entrance to the Hanauma Bay Nature Preserve. Now, you too can have one or all of his masterpieces in several affordable media options--It's the story behind each painting that allows him to express it in art so effortlessly. ORIGINAL: Hand Painted in Oil on Canvas, using paints invented by the artist. PRINTS: Double Matted Prints using Archival Quality Inks and Paper - Hand Signed, each comes with the story behind the painting and artist bio--available as frame-ready 8X10" (5 X 7 Print) or 11X14" (8 X 10 Print). Jumping out of the water, this dolphin has just caught a glimpse of the other world, the world of light and land, air and color. 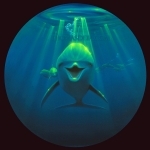 Arcing up towards the ceiling of light, the dolphin lifts its head, smiling and appreciating the beauty of the world they live in - and the world above, if for only but a moment. With the success of Myrtle the Turtle, we felt like we were neglecting her true creator, so Thomas unveiled her Mommy in all her glory. See where Myrtle got her smile? 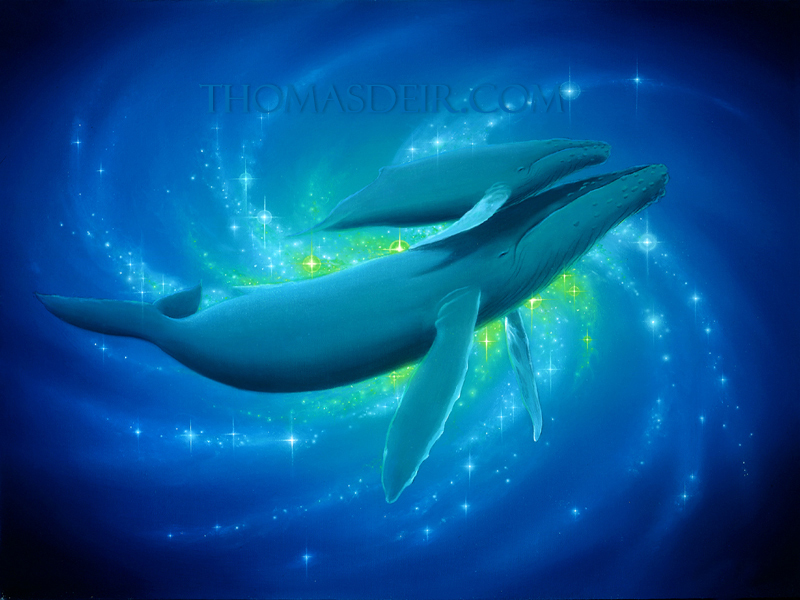 Whales seem so "other worldly", sophisticated beyond our comprehension, yet so simple and gentle. The bond between a mother and her calf is celebrated here with a galaxy of light and movement, resulting in the calm stillness of outer space. 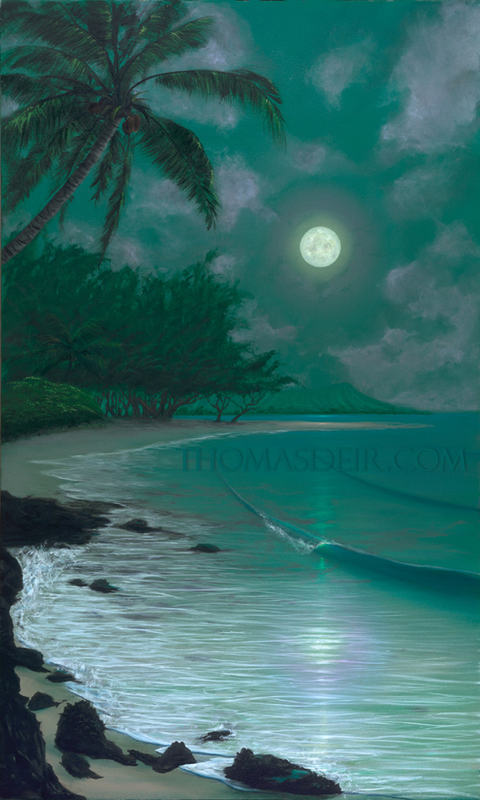 Looking from the west side of Oahu towards Diamond Head, the full moon glows and reflects off the silver liquid ocean as an aura of circular light rainbows around the moon. This painting was a commission from a pilot and her husband, a contractor who built their dream home and literally built the wall for the painting, complete with lighting specs and recess dimensions. I went flying in Phil Godwin’s seaplane ultralight to get the reference pictures. Unlike my plane, this was a hanglider type (a trike we call it), very different control and feel when I flew it! The goal of this piece was to create a dramatic sense of depth perception and height. A perspective that is unfamiliar to most (unless you are a bird), it is ideal for showing off the beauty of all of Kailua’s Lanikai. 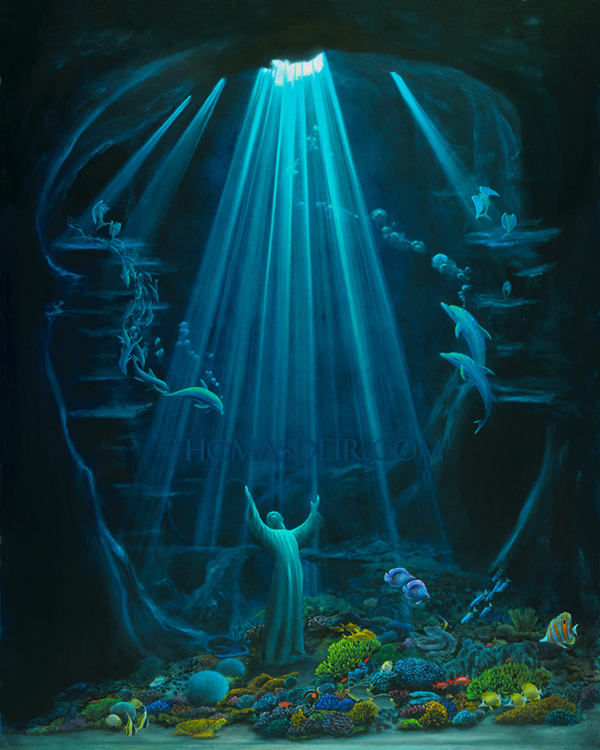 This painting uses 6 elements of depth that maximize the effect. 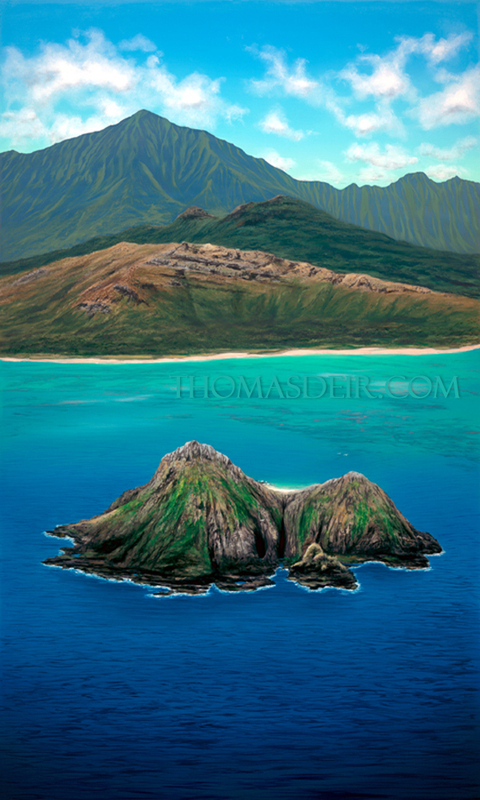 To create the illusion of depth in the most dramatic way, I chose a vertical composition that started with the foreground element (Mokulua Island), followed by the middleground elements (Lanikai Hills and Mount Olomana), and completed with the background (Koolau Mountain Range and the sky), all tied together with the ocean. Proper manipulation of the science of color and value are the keys to a successful illusion. 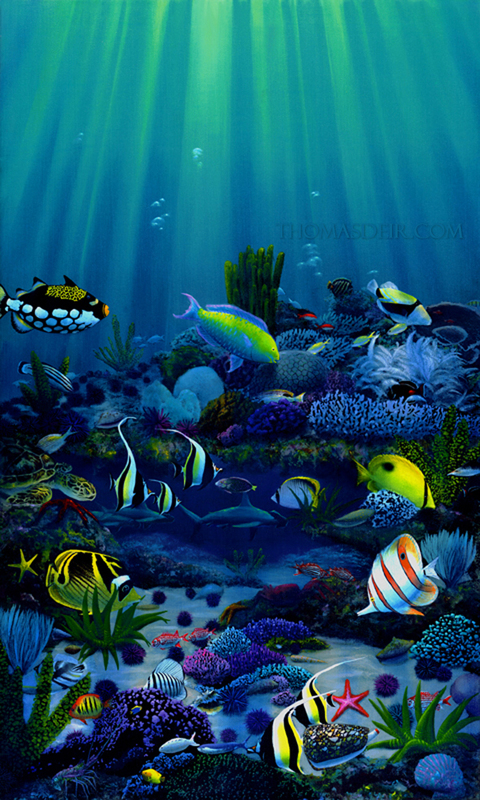 The ocean’s texture helps to extend the foreground, along with the high contrast and extreme chroma in the island. Created in 2010 for the 40th anniversary of the Kailua Men’s Night Doubles Tennis tournament at the Kailua Racquet Club, this was the classic concept used when the tournament first started in 1970. Capturing one of the most special times of the day, only several times a year, the Kalaheo hillside glows with the last of the sunset colors reflecting off Kawainui Marsh and Kailua Bay as the night sky falls under a crescent moon. Power, beauty, grace, depth, peace and love are the words that describe this work of art. The light rays accent the aesthetic grace and calm power of one of earth’s largest yet humblest creatures. 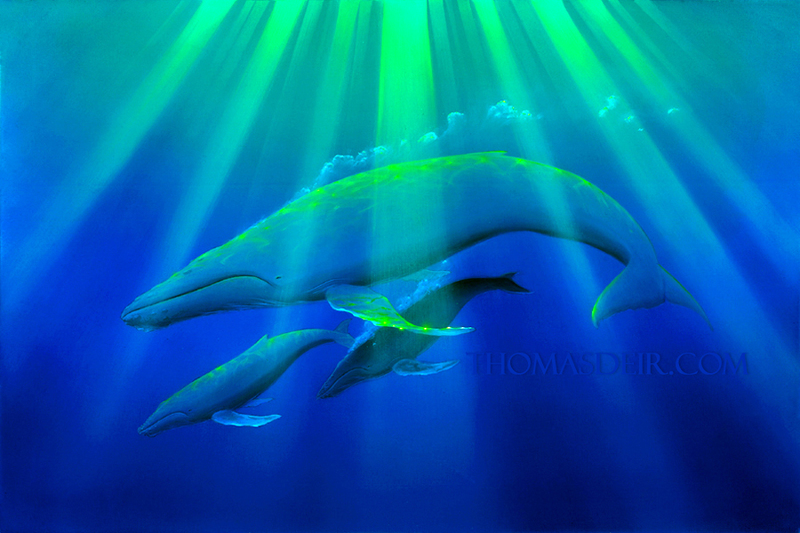 One of Thomas' favorite pieces, it achieved his goal of the awesomeness of the humpback whale. Sometimes you need a story to really "see" the painting, other times you just see it. The shape of the cave is the island of Oahu. 2 divers coming back to the surface aren't aware of the school of hammerhead sharks cruising by overhead. The best experiences in life require of risk, even love. There are 3 “ego states” we exist in; the parent, the child, and the adult. Dolphins are ambassadors of the child ego state. There is no creature that spends almost all of its existence playing like dolphins do. The title of this painting says it all – a bunch of dolphins playing, and one of them sees you and curiously swims right up to you to make friends! Look at the happy smile on this dolphin’s face while the mischievous friend comes swimming up behind. The other dolphins haven’t even seen you yet! You know they’re coming too! 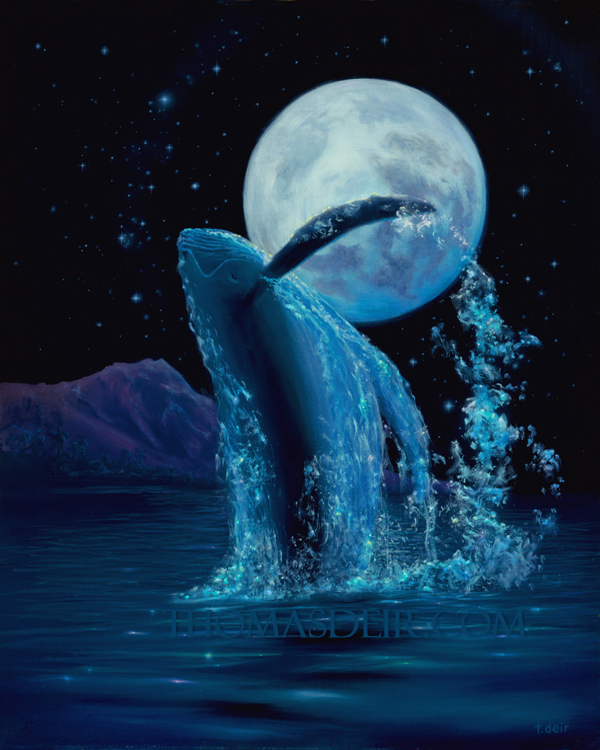 A whale breaches in Waikiki against the full moon, creating a dramatic sparkle of light and color in a rapture of passion that only the full moon can bring. A turtle’s journey to lay eggs on the beach is sometimes a struggle that involves risks of shark attacks, fishnets, boat propellers and navigation. 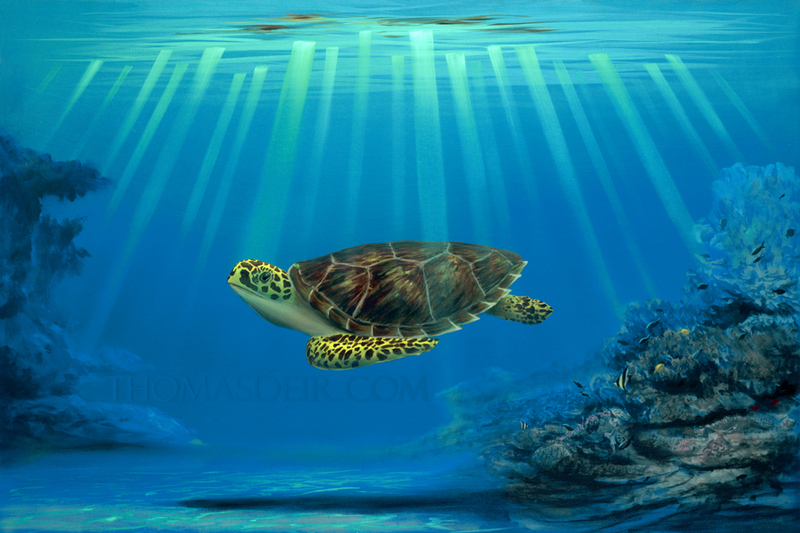 This painting symbolizes the amazing survival of the turtle despite its lack of offensive protection. Created for Ferguson’s Bath, Kitchen and Lighting Gallery, this piece was a tile mural made for a kitchen backsplash. 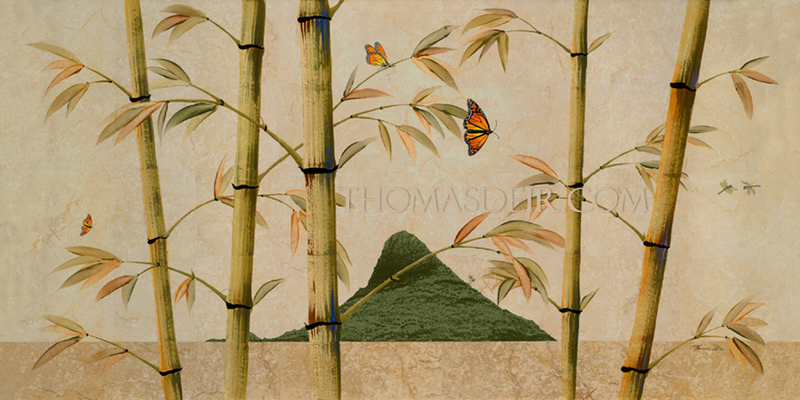 Thomas liked the piece so much he uses it in his tile mural advertising and decided to reproduce it as a fine art piece. “Chinaman’s Hat” is an island in Kaneohe Bay on Oahu in Hawaii. It resembles the type of hat worn by the Chinese in the rice fields. "I Just Gotta Be Me"
This painting is just a simple example of Thomas’ sense of humor, painted from an actual tree Thomas sees all the time while driving to the North Shore to go surfing. “I think people will see this painting and see themselves as this tree”, says Thomas, “because in life, being different is being yourself”. Or, as Frank Sinatra said in his famous song, “I did it my way”. Prints have the saying on the picture. Kauai is the northernmost island in the Hawaiian Island chain. 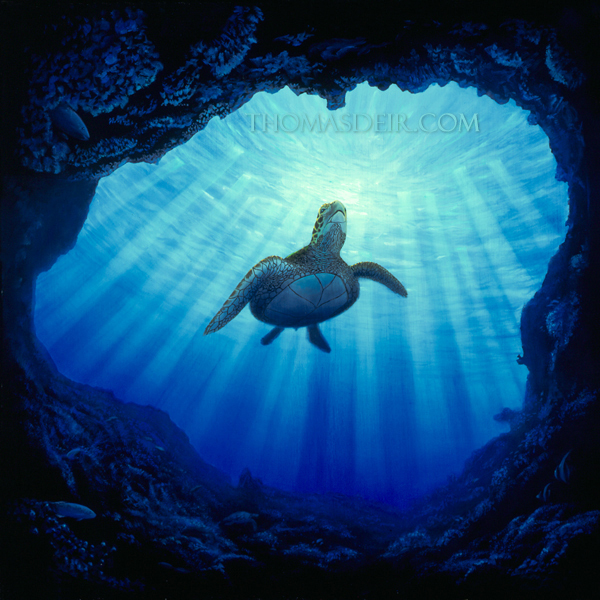 A turtle swims through the light rays toward the light, out of a Kauai cave and up to the surface for a breath of fresh air. Can you see the shape of Kauai in the cave’s outline? 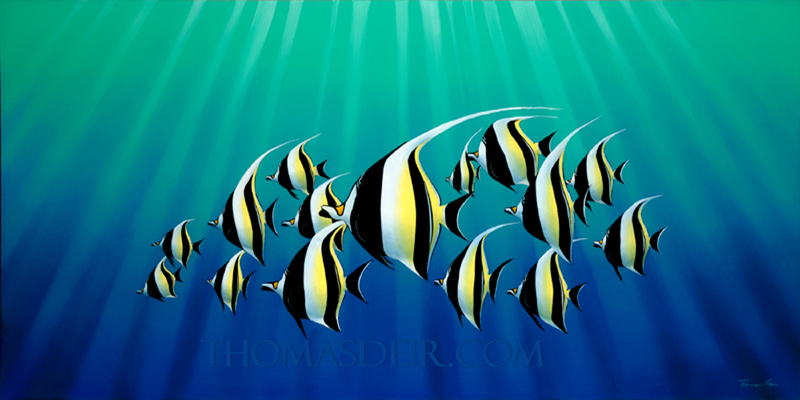 Initially considered by Thomas to be a “loose”, or “painterly” piece, this painting has become very popular. “Mokulua Milky Way” was reproduced due to customer demand. 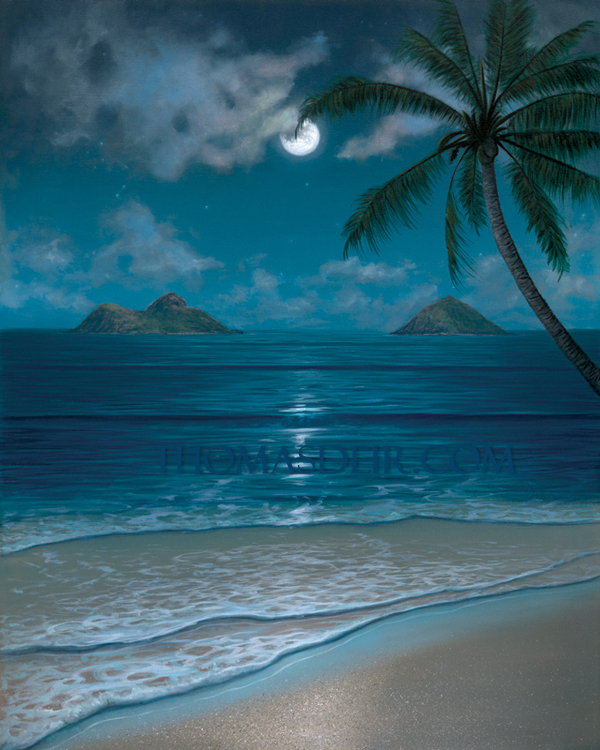 Part of the Mokulua Island series, it depicts our Milky Way galaxy “splashed” across the sky as the full moon rises between the Mokulua Islands. The glow around the moon and the starry sky have made this painting very unique. 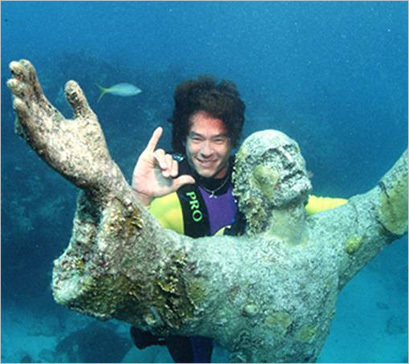 The Mokulua Islands are off Lanikai, in Kailua on the island of Oahu in Hawaii; otherwise known as the Twin Islands. 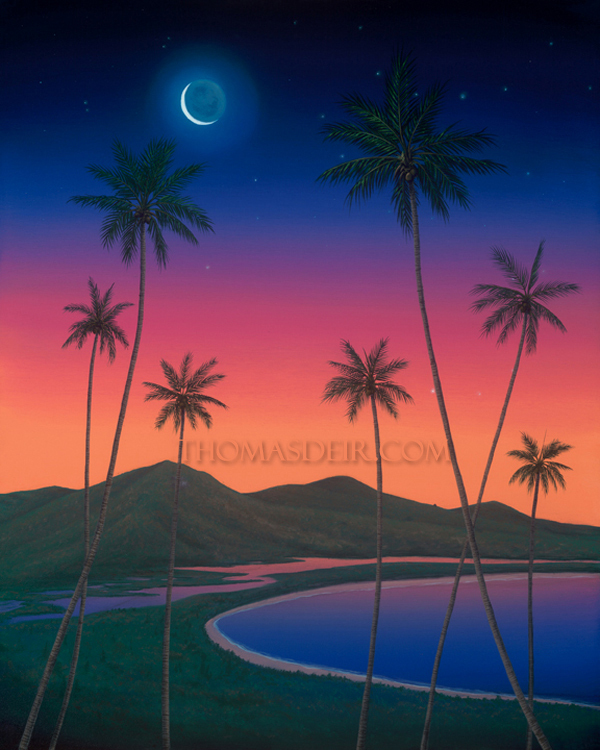 Thomas had a mission in this painting – to capture the subtle rainbow around the moon that one sees on those still cool Hawaiian nights. Satisfied with the completion of this painting, Thomas invented a new way to do circular rainbows and has used it on several other paintings. 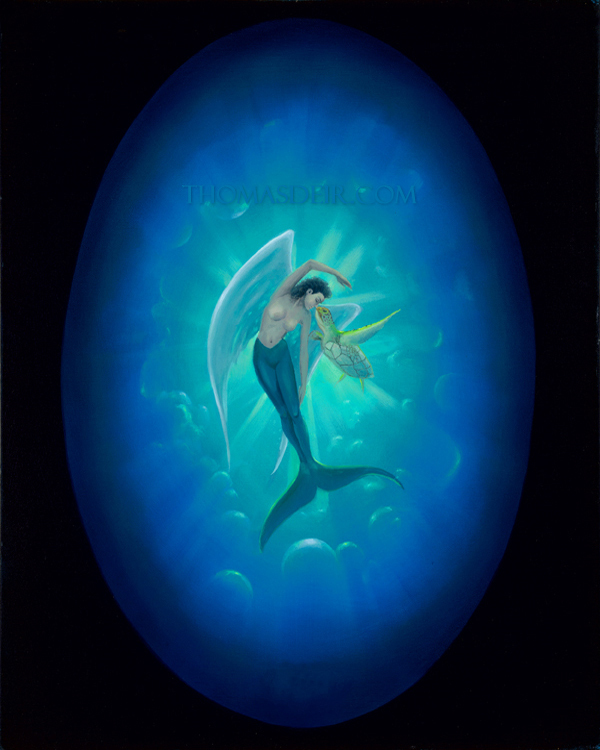 Combining the mermaid and the angel results in mermaid angels, first conceived for Thomas' signature painting, the "Christ of the Deep". 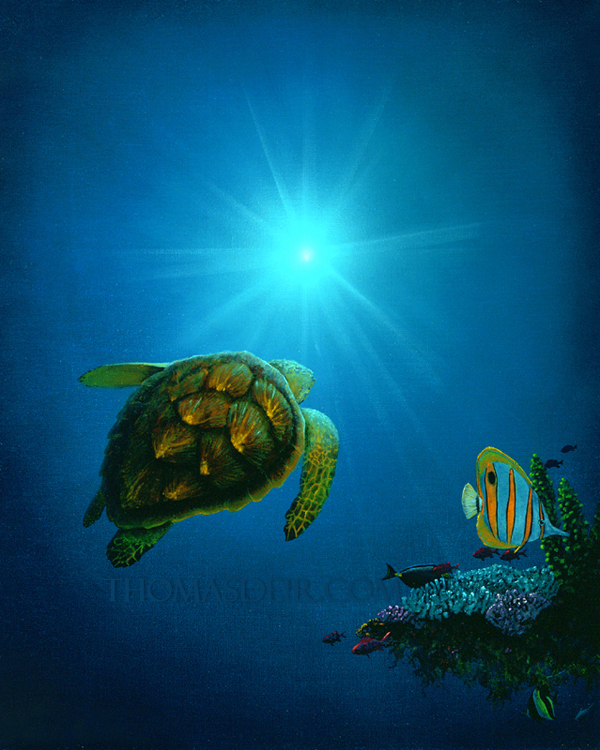 A curious turtle, or "Honu", touches the beautiful mermaid angel as they affirm the love for their special part in this special world. One of a kind piece. Very sentimental to Thomas. 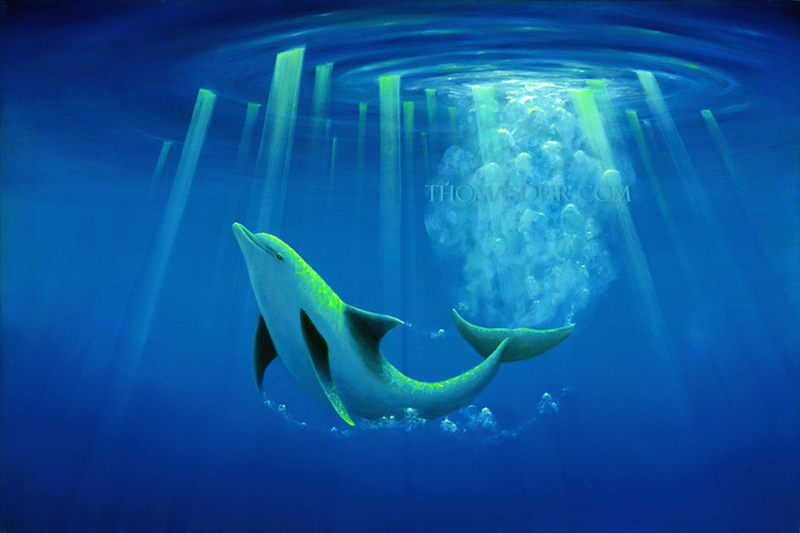 One of Thomas’ favorite paintings, “Emerald Forest” illustrates the intelligence of the dolphin. 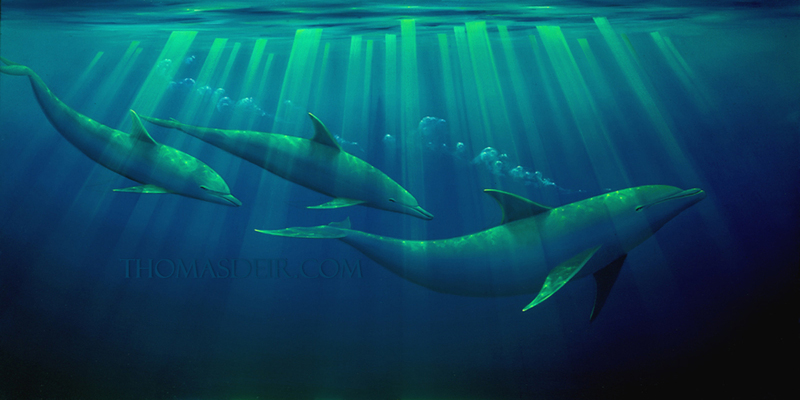 Cruising through the forest of emerald light rays, these dolphins acknowledge and respect each other while their individual thought bubbles to the surface ever so gracefully. Wherever you are, whoever you are, this is where you want to be. 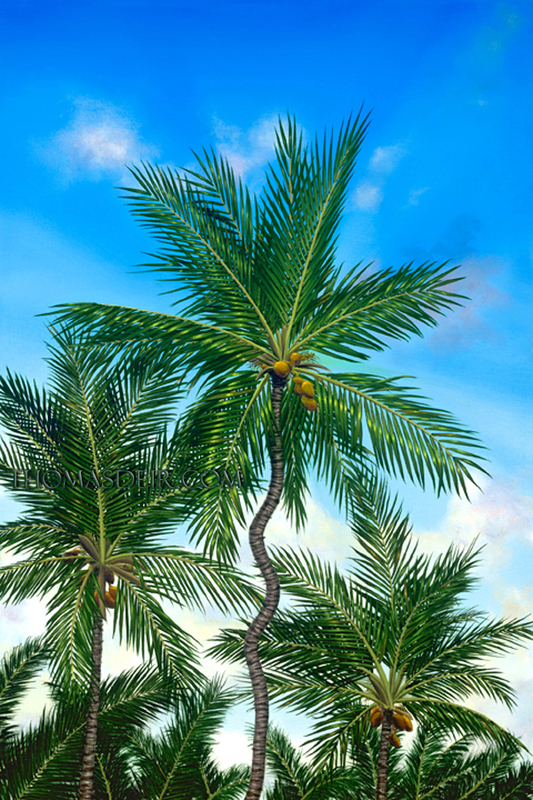 Relax, slow down, and enjoy the crisp stillness of sitting under a coconut tree on a tropical vacation. Take a deep breath and take in the meditative experience of gratitude. You deserve it. These unique fish are often called angelfishes, but they are not. They are the graceful moorish idols, whose unique shape and long top fin give it a flowing, dynamic movement remininscent of a ribbon flowing in the wind. 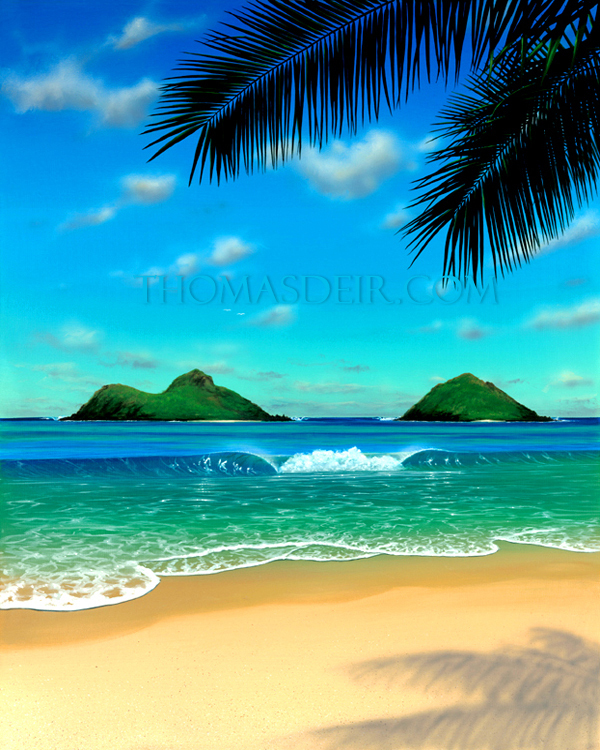 Thomas flew an ultralight seaplane for years around Kaneohe Bay on Oahu, Hawaii. Many days were enjoyed flying around this island called "Chinaman’s Hat", as it resembles the type of hat worn by the Chinese in the rice fields. This ideal perspective captures the beauty of the majestic Koolau mountains. 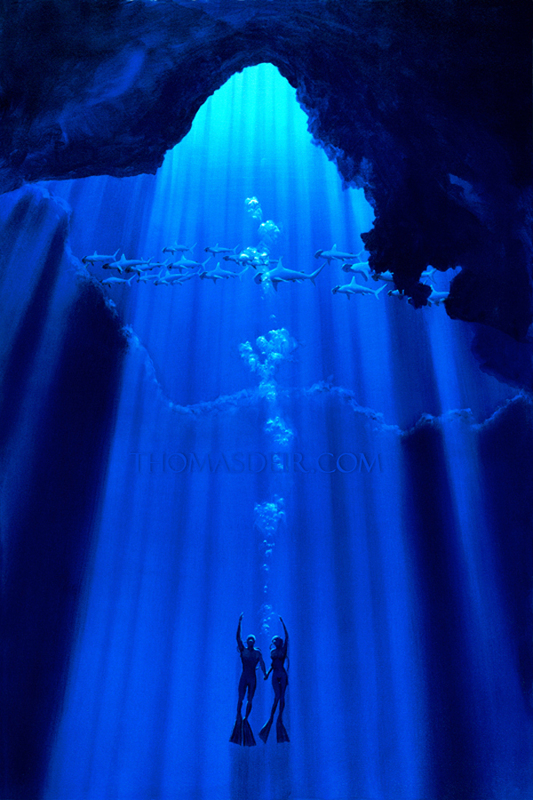 This piece is the result of many studies into color harmony and theory as Thomas was making the transition from underwater artist to landscape and seascape artist. Although very challenging, this is the piece that finally made it to reproduction. A rare type of sunrise to see anywhere, this is the kind of sunrise (or sunset) that gives one the feeling of a ceiling of light that stretches across the sky and only lasts but a few minutes. This one is in Lanikai, in Kailua on Oahu in Hawaii, featuring the Mokulua Islands, otherwise known as the Twin Islands. 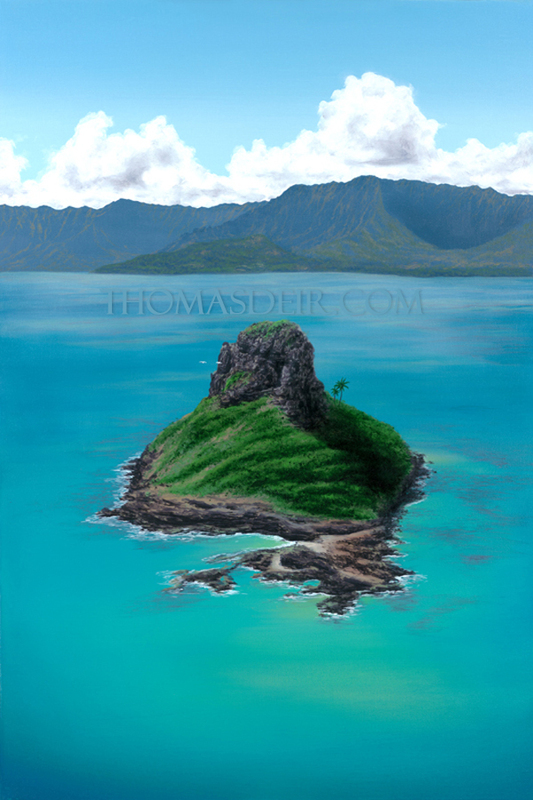 After the Mokulua series got off the ground, many clients were asking for a daylight scene of the Mokulua Islands, off Lanikai. 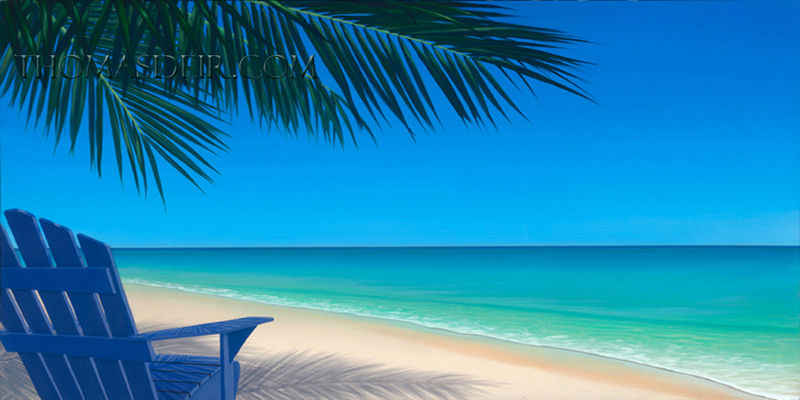 “Paradise” was born, followed by it’s sister painting, the horizontal “Paradise Rainbow”. Vertical compositions command reverence and respect. Horizontal compositions are peaceful and relaxing. One day in March of 2010, a big wave broke on Thomas’ shoulder while surfing out here, dislocating his right shoulder and causing immediate paralysis to his arm and hand. Fortunately, Thomas is a left handed artist and took this accident as an opportunity to create more paintings.